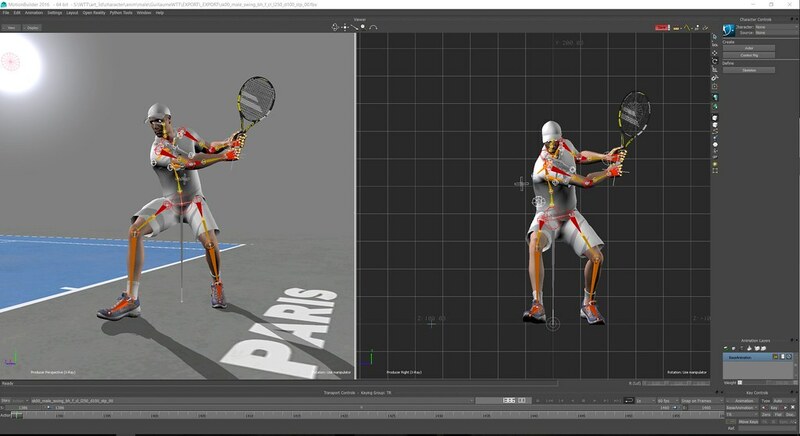 How the team at Breakpoint is going all-out in their upcoming PS4 tennis simulation. Breakpoint was created a little over a year ago, with the goal of creating a studio specializing in developing sports simulations, particularly tennis simulations… hence the name! This dedicated structure was built around talents who had worked on the Top Spin licence, starting with its director and founder. By the way, our director was the associate of the director of PAM, who created the licence. In addition to the company’s director, we have notably worked with Pierre André, who presided over Top Spin 3 and 4 as Lead Game Designer, as well as Jan Zamecnik, who was the Lead Animator on Top Spin 4. The rest of the team is made up of industry veterans, who all share a similar passion for the sport. Several factors pushed us to work on a new tennis game. There hasn’t been a game like this for a long time, and so there’s a big expectation from the fans. Additionally, current generation consoles are more powerful, which allows us to offer the players many new things, especially in terms of gameplay. And finally, the chance to work with a publisher like Bigben who wants to get involved in the creation of various sports games is a great opportunity. One of the key aspects of the game which we paid particular attention to is the creation of animations for the tennis players. A tennis match is a very specific choreography of movement: player movements, inertia from running, the different strokes with which you can hit the ball… Reproducing animations that are as close as possible to reality was a huge undertaking, which required numerous steps on the way. Once we defined the strokes, the movements, and the effects that we wanted to add to the game, we moved on to an important analysis phase where we deconstructed all the movements we needed to reproduce using videos of professionals: what are the different movements to hit the ball in every direction, how high do you need to raise your shot, how much power do you need to put in every shot… It is tantamount to thousands of movement combinations to recreate. Each operation must be listed and referenced for one of the key steps of our work: the motion capture phase. We did these motion capture sessions with professional players on real courts so that they could reproduce as faithfully as possible all the movements and sensations of tennis. Each movement is played and saved, in order to be integrated in the game. We’ve also given a lot of thought to how to deconstruct the animations so that they can be chained one after the other. Each movement is progressively integrated and tested in order to see if it corresponds well with the game mechanics. It was a long, drawn-out part of the development, because the more animations we integrated, the more the possibilities multiplied. A new motion capture phase is planned, in order to complete all of the different moves already available. Some of them are very rare, such as the between the legs shot but we know that with this kind of movement, players will be able to really deep dive into the tennis experience we want to offer. It’s a progressive project, which takes a lot of back and forth. We’re already very happy with the results, but we still have some adjustments to make, for example with the physics controlling clothing and hair. We have room to improve the animations and we correct everything by hand to ensure the final quality of the game in the end. Our goal is to obtain a result that will give players an experience close to what they see during professional matches. We want Tennis World Tour to meet all the players’ expectations and fill the void that’s been left in tennis games for the last six years. We’re passionate about it, and it’s a real opportunity for us to work on such a fun and demanding game. We hope that tennis fans and players in general will be as excited to play the game as we are to work on it day after day. I’m extremely excited about this game, because I’m big fan of tennis in real life, passionate player who played every tennis game on PS3 or PC. Top Spin was the best franchise ever, so it’s good to see two major Top Spin’s veterans involved in development of Tennis World Tour. But, only thing which missed even in Top Spin series was a realistic gameplay during rally, for example the best known players on the tour never makes mistakes (hit the net from a clear shot or throw the ball in audience). That momentum is very important just like mentioned animations. I saw that realism only in Tennis Elbow, so I call this through Pierre André and Jan Zamecnik to find and see some of gameplay from this game. Also, I hope that developers will include challenge call during the play and robust career mode (singleplayer mode) of course. I can’t wait! That’s great news, we definitely need a new tennis simulation. Hope that along realism in match development and stoke difficulty, there will also be a realistic career mode. With progression and an alive environment with other player changing their performances as their career reaches new stages. Really can’t wait for the full release. Been alternating between Virtua Tennis 4 and Tennis Elbow 2013 on PC. Stop playing Top Spin 4 on PS3. This will really bring a fresh group of players to the ITST scene. Hopefully, the stroke mechanics of the 30 Professionals do line up. Top Spin 4 Federer should have a Platform serve than Pinpoint. 6 years between the last Console Tennis game, means a lot of fresh players. Hopefully there in Kyrgios, Zeverev, Goffin (Confirmed), Thiem,Raonic, Nishikori and Dimitrov. Some of the next gen players and lost gen ^^. Guessing the other 2 are either Querrey, Johnson or Tiafoe. Seen the Alpha, Stroke Mechanics look more natural than the predecessors. Graphics get a lift up when the full build is out. Wonder if there is the stamina gauge like in Top Spin 3/4. If the timing will be a huge factor like Top Spin 3, R1/L1 Hard hitting. Please let it have a Platinum, mostly offline trophies. No hard or impossible to do like NBA/Fifa. Some of gameplay from PSX 2017 during interview with developer. I’m so-so after saw this gamplay, but it’s just alpha in-game footage, so developers have enough time until May 2018 to makes all fine. Old Gen: Federer (Confirmed), Djokovic, Nadal and Murray there too. Del Potro as well. Roddick would be nice as well. Monfils (Confirmed). Stroke Mechanics look more natural than the predecessors. Graphics get a lift up when the full build is out. Stamina Gauge? R1/L1 Risk Shots?